Today my guest is Michael Fairbrother, the founder and CEO of Moonlight Meadery. Michael is also a nationally award winning mead maker and has brewed some of the finest Braggots I’ve ever tasted. We start with a discussion of what Braggot is and also a bit about the history of Braggot. Michael explains some of the interesting regulations surrounding Braggot which is in a bit of a no-mans land in many states due to differences in laws governing breweries and wineries. Michael talks about the two basic ways of creating braggot – fermenting the honey and barley togther versus blending a finished mead with a finished beer. We discuss which beer styles are best to use as a base for a Braggot, but also how experimenting can create some interesting results. Michael shares his process for brewing an award winning Braggot. We talk about the use of nutrients and oxygen during fermentation. Michael shares his thoughts on sulfites and sorbates used to arrest fermentation and stabilize the braggot. He explains the backsweetening process, though he does not use it much. 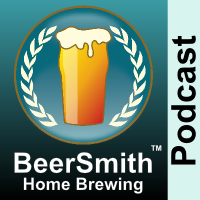 We discuss filtering a mead or Braggot and what options you have at home. Michael talks about the historical use of spices and some spices you can try in your Braggot. He shares his final tips on Braggot. Michael shares some of the new things going on at Moonlight Meadery including both Braggots and Ciders. Thank you for posting great articles on beer making.